The first course, which can be performed by any diver, is the Diving Emergency Management Provider (DEMP), translated into Portuguese as a Diving Emergency Management Provider. Use of Automatic External Defibrillator -DEA. First Soccoros with Oxygen in Diving Emergencies. 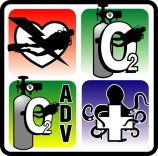 First Advanced Soccoros with Oxygen in Diving Emergencies. First Aid for Accidents with Dangerous Marine Animals.